Women's Phoenix Black Moto Boot Just $18.75! Down From $65! You are here: Home / Great Deals / Christmas Deals / Women’s Phoenix Black Moto Boot Just $18.75! Down From $65! Women’s Phoenix Black Moto Boot Just $18.75! Down From $65! Sears has this Women’s Phoenix Black Moto Boot on sale for just $25 (Reg. $65) nut you can get an extra 25% off when you use prom code CYBER, making it only $18.75! Cultivate a chic biker-style look with the women’s Phoenix moto boot from SM New York. 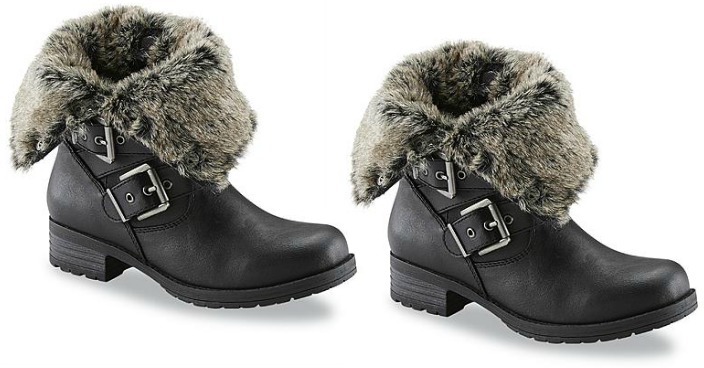 The shaft of this black synthetic leather boot can be worn up or folded down to reveal a plush faux fur lining. Decorative silvertone buckles accent the side of this rugged yet stylish design.